We're Counting our Blessings, and You're High on the List! You are here: Home / Appreciation / We’re Counting our Blessings, and You’re High on the List! Your gifts, big and small, are transforming the lives of orphans and widows every single day. Sometimes in ways you might not realize! From little things like fresh milk or a sweater, to big deals like beds and school supplies, we want you to know just how much you are blessing these kids. You were an answer to prayers in Uganda with cozy beds and warm sweaters. The old wooden beds at the Buloba Kinship Project were rotting and had become breeding grounds for bedbugs and carpenter ants. But thanks to you, they now have brand new metal beds, and they are bug-free! While you may not think of Uganda as being chilly, Buloba does get very cool during the rainy season and in many evenings. The kids need to be able to bundle up, and their warm clothes had all worn out. Now, thanks to you, they each have a nice warm sweatshirt to keep them cozy. You are bringing joy to the Aruba Kinship Kids with a cow. The Aruba Kinship Kids are raising a few cows, and they love the experience. They especially love fresh milk to have in their tea every day. It really is a special treat! You made sure Jefferson and his Kinship family could go to school. When the children at the Cayacoa Kinshsip Project in the Dominican Republic were short on school supplies and uniforms just as the school year was starting, they were so anxious that they might not be able to start the school year. Like Jefferson, a straight-A student, math whiz, and aspiring dentist. Not long ago, he was sifting through garbage in order to survive. But since he moved into the Cayacoa Kinship Project, he has loved going to school. 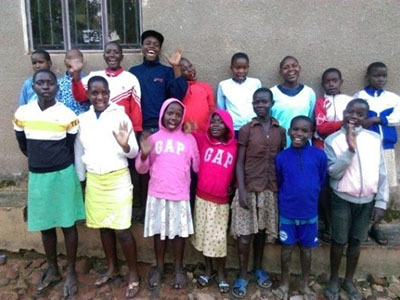 Thanks to you, Jefferson and his siblings had all they needed to start the school year strong! Sometimes these feel like “little things” that happen every day. But they make a huge difference for the orphans and widows you are caring for with your gifts. They remind them that they are not alone, and that they have someone out there who cares about them. That’s you! Thank you for all you do with your support.